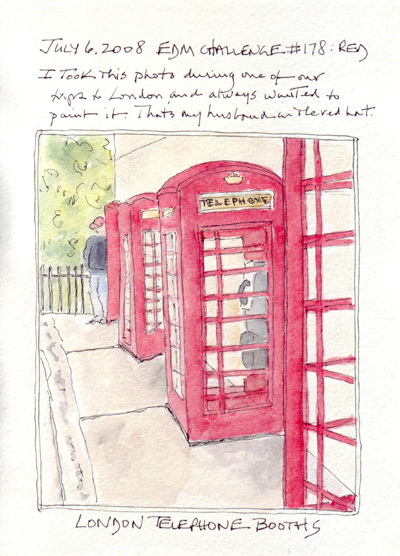 My husband and I were walking to our grandson's school in London to pick him up when I saw this wonderful row of 4 phone booths. Usually they were single or in pairs in neighborhoods we visited - so I had to get this photo to later play with perspective. And I never did! That is my husband in the red baseball cap - waiting for me to catch up! It was a nice challenge for me to draw this and I listened to Danny's recent Podcast while I sketched and painted it. A good quiet Sunday afternoon. Our children were all in New York City several weekends ago to celebrate my birthday, Henry's 5th birthday party, and Father's Day. Annabelle, just barely 3 months old, met her 4 New York City cousins for the first time and we tried to get yet another picture of all of our grandchildren together. This is always a hilarious event - with 3 cameras flashing and the other adults jumping up and down to make them smile. Sometimes the out-takes are so funny that we print them as a series. NOT A SINGLE PHOTO is ever near-perfect. There are many funny faces, closed eyes, fingers in mouths and noses - and the youngest one usually starts sliding sideways sometime during the event. For the second half of the photo-shoot Callum had his thumb in his mouth and elephant in front of his face - thereby eliminating half of the 50+ photos that were rapidly taken. Our daughter has 3 children and my sons each have one. 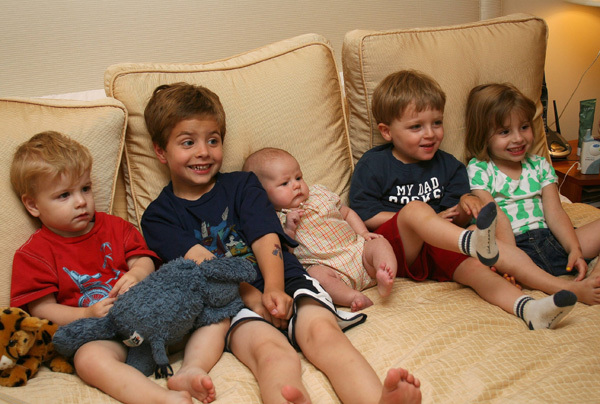 From left to right: Callum (1 1/2), Henry (5 yrs), Annabelle (almost 3 months), Robbie (almost 3), and Sydney (3 1/2). Like most grandparents- we adore them and spend any available minute with them. I'm always happy when I can post an EDM Challenge before the next one is announced. 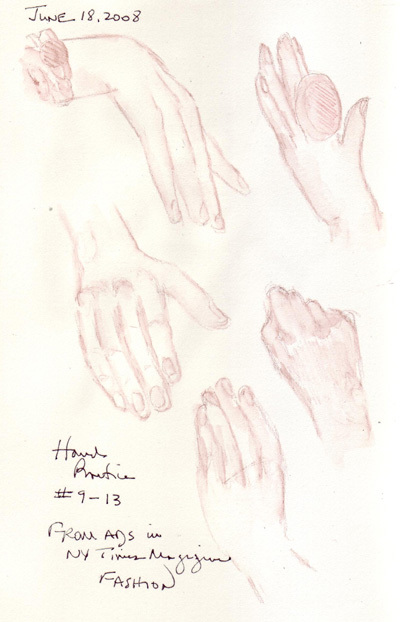 These exercises are great for me to do and I try to stretch my skills a little with each one. We were on vacation when the "Sparkle Challenge" was posted and I really wanted to try to capture the light of a gem stone. I'm not very good painting reflections and I kept looking for a big stone. I even took a photo of the Hope diamond when we were in DC. 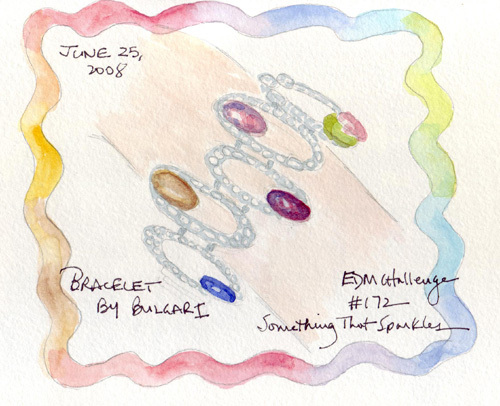 But then I decided to just draw a Bulgari bracelet from an advertisement and move on. I also took photos of cute little Capitol Hill houses with flags blowing in the breeze on our trip to DC because I knew that ! couldn't draw a moving flag. 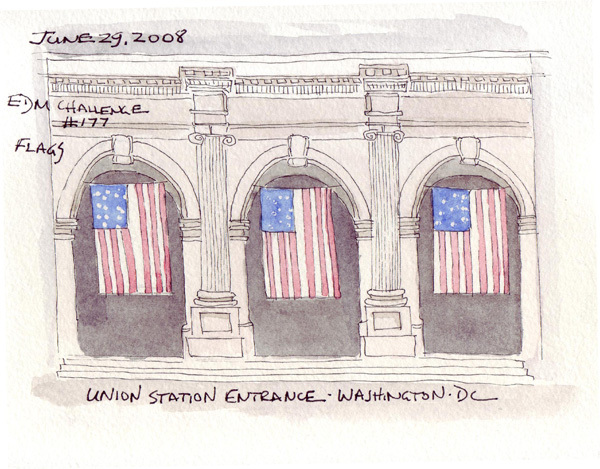 Then, at the end of my taxi ride to Union Station following my meetings, I looked up and saw the facade of the station. I grabbed my camera, took several photos and headed inside for my train back to New York. 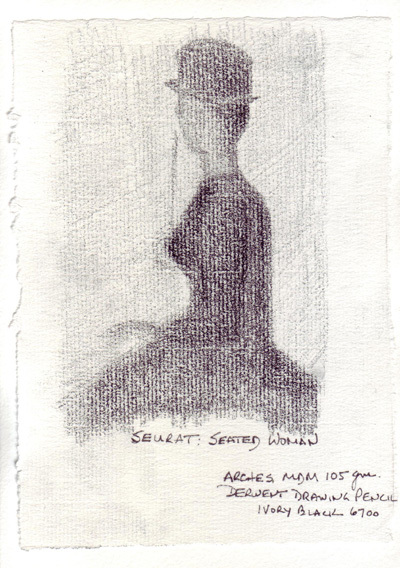 I loved the Seurat Drawings Exhibit at MoMA NY and was especially fascinated with the paper (click on the Conservation button). 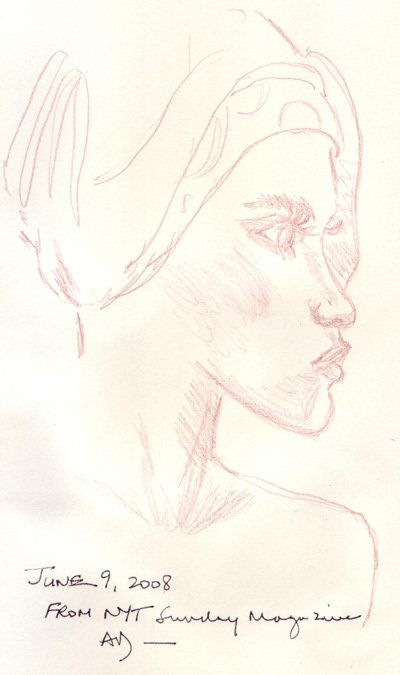 This is especially interesting because I don't even sketch with Conte or charcoal. I looked up the Michallet paper and learned that the modern day equivalent is available at NY Central Art Supplies. I bought a sheet while I was there on Saturday just to experiment with it. 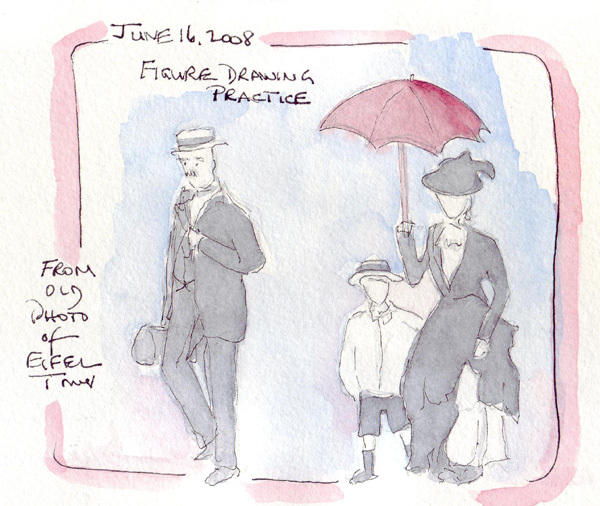 I ripped it into smaller pieces and now will play with it, using Seurat's drawings as my inspiration. 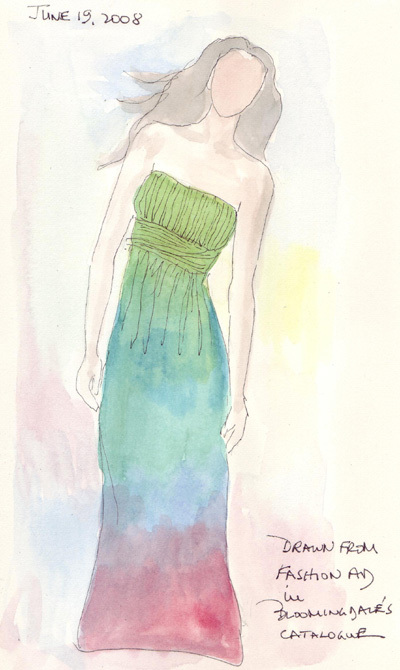 Here is #1 - done with a 1/8th sheet and a Derwent Drawing pencil. 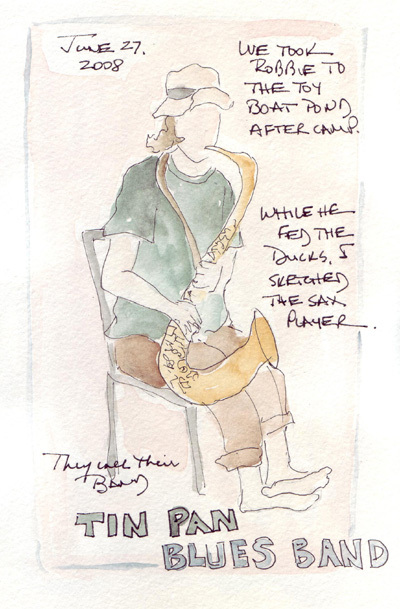 Here are 3 more faceless figures from the month of June: three Parisiennes from a 19th C photo, a sculpture of Marilyn Monroe in a Washington DC hotel, and a sax player from the Tin Pan Blues Band that I sketched in Central Park while my husband watched our grandson Robbie feed the ducks. 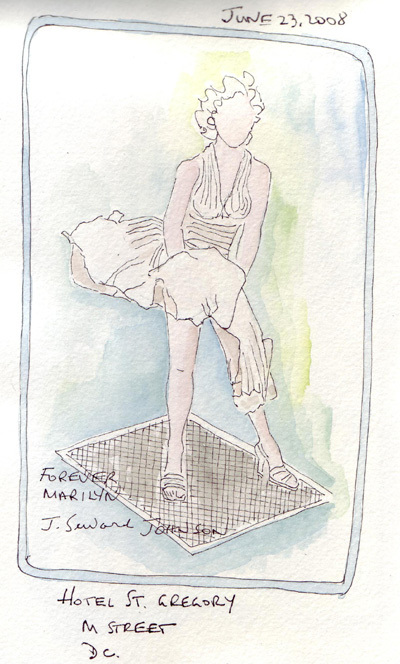 If you "google" the name of the sculpture and sculptor, you can see what Marilyn's face looked like. I still work on faces, hands, and figures some days each month. Here are 3 of the journal pages I did in June. These came from the NY Times Sunday Magazine and a Bloomingdale's catalogue. I'm still waiting for the day when I can add a face to a full figure. Somehow, I sketch grotesque faces when working this small or make them comic book simple. Oh well - maybe 2009!